Hi Jago in Germany! Happy Dog to you, from all in this Lab loving home! 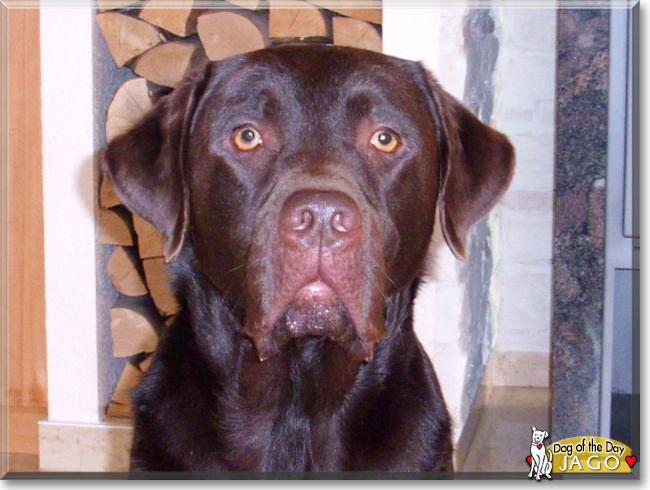 What a gorgeous, simply stunning Lab you are, Jago, a big hunk of chocolate perfection! In body and spirit, inside and out, you're the quintessential Lab, embodying all we Lab lovers cherish in your beloved breed! How lucky your young human is, having a beautiful, smart and talented, athletic and energetic, big hearted best friend, loyal and loving companion, full fledged family member in you! You truly are one EXTRA special boy, Jago, beautiful inside and out, the BEST dog and pet, EVER! Thanks for the BIG smiles, Jago! Meeting you today has been a real treat! I hope you're enjoying a very special day of celebration...taking a nice, long walk through the fields with your human, playing fetch, chowing down on yummy treats, cuddling with your human, being loved and pampered to pieces! Lots of love, hugs and smooches to you, beautiful Jago, our very special and most deserving Dog of the Day, EVERY day! Dearest Jago, you are beautiful! What a gorgeous Labrador Retriever you are, indeed! You have a delightful personality, too. You love to walk and run and play, and you know several tricks. You are truly a member of your family, and you and your dear family members all love each other very much, don't you. What a wonderful love-filled home you share! Congratulations, darling Jago, on being chosen today's Dog of the Day! We hope you and all your family and friends are enjoying a fine celebration, full of fun and lovies and all your favorite games and treats, maybe some special pig ears or dog biscuits! Last edited by phesina; 02-06-2019 at 08:56 PM. What a handsome boy you are, and smart, too. Congratulations on being Dog of the Day, handsome Jago!